Clinton-Massie teacher Kristen McGraw summarizes the Grid Method of learning. Chuck Muchmore urges Clinton-Massie officials to take a look into arming some staffers as a way to limit the number of victims in an active shooter situation. Clinton-Massie fifth-grade student Danny Mefford, right foreground, shows his invention the “Baby Saver” child car seat which alerts adults to dangerous changes in car air temperature. In the background from left are school board members Andy Avery and Mike Goodall. ADAMS TOWNSHIP — After Christmas break, four of five Clinton-Massie fifth-grade teachers put into practice Grid Method learning — an approach designed to help every student progressively master skills at their own pace. 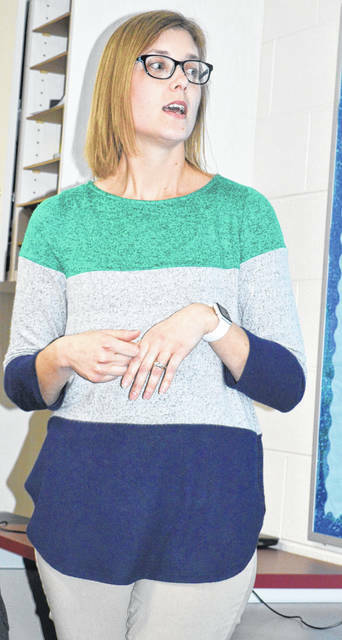 In Grid Method learning, students have to master a skill before they can move on, and the children get timely feedback at every step they take, said Clinton-Massie teachers Kelli Clear and Kristen McGraw in a Monday presentation to the school board. McGraw said she sees the most success from the Grid Method with her struggling students. She gave an example of a student who did not pass one reading test throughout the beginning of the school year, but earned a 91 on the first graded test after the Grid Method and an 89 on the next test. The method holds learners and teachers accountable, she said, because students have to master something before they move on, while teachers are accountable for their “check-off” judgment that a student really understands something before he or she can move on to the next thing. So, in theory and in practice, students have multiple opportunities to learn or master something. In addition, students who are good in a subject don’t have to wait for their teacher to move the entire class ahead. That’s because individual students move through a grid that contains five levels in terms of depth of knowledge and difficulty. Moreover, because students aren’t waiting on the teacher to move along the whole class onto the next thing, McGraw said they’re seeing a decrease in discipline issues. The teachers showed a video where Clinton-Massie fifth-graders gave their reactions to the Grid Method classroom. The students’ statements were favorable, with probably the most common positive comment being that they can work at their own pace, which may be slower or faster than the other students in that particular subject matter. 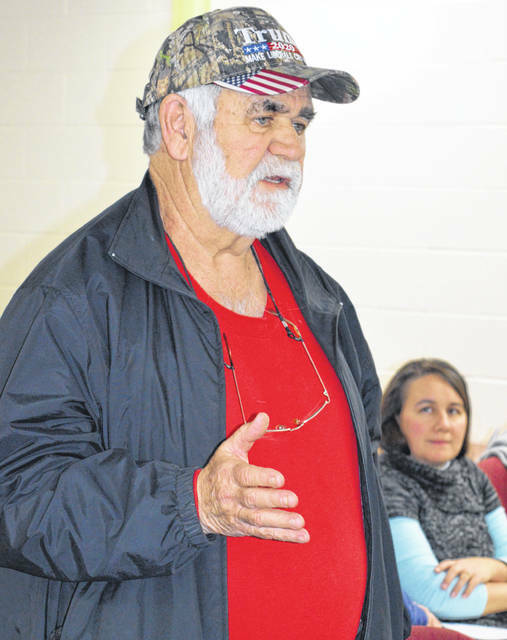 During public participation, district resident Chuck Muchmore urged Clinton-Massie officials to take a look into arming some staffers as a cost-effective way to limit the number of victims in an active shooter situation. “I have every respect for our [school] resource officers — our deputies I think do a tremendous job. But let’s face it. Everybody knows what that uniform means, so somebody who’s going to come in and do harm, they’re not going to do it in front of him,” said Muchmore. He said it’s his understanding teachers can receive firearm training related to the school setting and have it paid for by a State of Ohio grant. He also said the National Rifle Association has a free program where the organization will come in and look at a school’s safety situation and make recommendations. Clinton-Massie Local Schools Superintendent Matt Baker said he has contacted the director of a Children’s Hospital program in which a mental and physical safety assessment is conducted of a school at no charge. A lot of schools across the country are permitting staff to get trained and be armed, Muchmore said, and there are some cases where it has paid off. “I’m not saying it will stop everything that’s going to happen, but it can make it a smaller incident [when it does occur],” he said. On another matter, school board President Jeremy Lamb, a member of the Policy and Personnel Committee, said the district wants to be in a position to enroll some of the resident youths who currently do their schooling through online education systems. Some of them suffer from school-related anxiety and so they opt for an online education at home, said Baker. The superintendent thinks Clinton-Massie can address the situation and alleviate some of the youths’ anxiety through its own existing online academy and the hiring of an online coordinator. The position of an online coordinator would pay for itself if as few as four youths participate because the tax dollars would then come to Clinton-Massie, said Baker and Lamb. The Massie program could offer mental health counseling services, tutoring, support and a Clinton-Massie diploma, said Baker. Lamb also reported the district potentially will offer all-day kindergarten while keeping half-day kindergarten as an option. Baker said documentation shows that Clinton-Massie, which does not offer all-day kindergarten, loses kindergarten-age children to Wilmington City Schools (WCS) which does offer all-day kindergarten. When that happens, Massie loses out on tax dollars, and sometimes parents decide to have their children stay at WCS and the loss of prospective tax dollars then continues for C-M.
Lamb acknowledged there is a “lot of good literature out there” that speaks of the academic benefits of all-day kindergarten, but he said there is also the matter of parental choice and that is why Clinton-Massie wants to be flexible and keep half-day kindergarten as an option while potentially going ahead with all-day kindergarten, too. If more kindergarten teachers need to be employed due to all-day kindergarten, Lamb said he has asked the superintendent to make the hirings “budget-neutral moves” overall. Neither an expanded C-M online education or an all-day kindergarten have been decided upon yet. But Lamb wanted to get the word out about the possibilities because, if implemented, both could impact family decisions and enrollment for the upcoming school year. 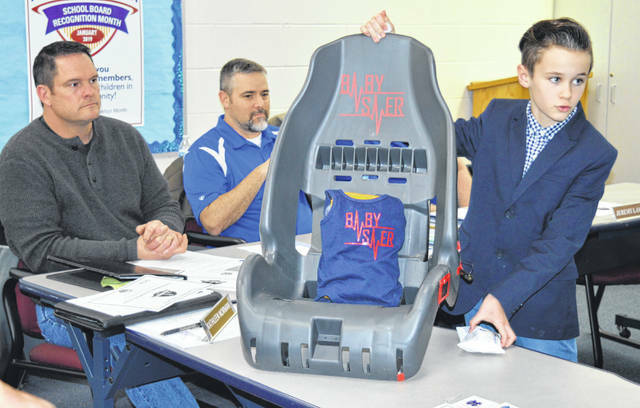 Also during the board meeting, Clinton-Massie fifth-grade student Danny Mefford showed and discussed his invention the “Baby Saver” child car seat which alerts adults to when the temperature in a vehicle is too hot or too cold for a child. Mefford is part of the Invention Convention and will represent Clinton-Massie this summer at the national event. Before explaining how his invention works, Mefford said a baby’s body temperature rises 3 to 5 times faster than an average adult’s. Since 1998, there have been over 800 hot car deaths in the United States, he said. Mefford’s Baby Saver car seat will set off an alarm if the car’s air temperature reaches 85 degrees or drops to 55.